What to read next is nearly always a difficult question, the problem being that I have so many books I’ve bought/borrowed that I really want to read right now and much as I would like to I can’t read them all at once. So, this morning here I am nearly ready to start a new book and wondering which one to go for. 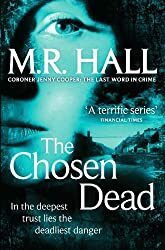 It could be The Chosen Dead by M R Hall, his fifth novel in the Coroner Jenny Cooper series. The last thing Roy Emmett Hudson was expecting on the eve of his forty-first birthday was a bullet in the head, but life and death are only a single breath apart, and as a biologist, he appreciated that more than most. Even as he strolled across the company lot to the Mercedes CoupÃ© he had driven all winter without once raising the roof, his killers’ thoughts were already moving on to where they might dump his body so that it might never be found. When Bristol Coroner Jenny Cooper investigates the fatal plunge of a man from a motorway bridge, she little suspects that it has any connection with the sudden death of a friend’s thirteen year old daughter from a deadly strain of meningitis. But as Jenny pieces together the dead man’s last days, she’s drawn into a mystery whose dark ripples stretch across continents and back through decades. In an investigation which will take her into the sinister realms of unbridled human ambition and corrupt scientific endeavour, Jenny is soon forced to risk the love and lives of those closest to her, as a deadly race to uncover the truth begins . . .
I’ve not heard of this series before, but it sounds like something I would enjoy. That beginning makes me interested to know what happens! I like how they’re contrasting Emmett’s thoughts with those of his murderer, very interesting! Sounds like a good one to read next! Thanks for sharing 🙂 I hope you have a great weekend! Sounds really good! Thanks for sharing and enjoy. The opening jarred me. At first, I felt like I was in Hudson’s head, but then the killers’ thoughts are mentioned. What’s the point of view? However, the opening did intrigue me. I’m curious about this book. I’ve read all of these including the most recent, ‘The Burning’. I find them interesting from the point of view of learning about the job of the coroner but realised as I got to the end of this last one that what had been niggling at me about the series was that in Jenny Cooper, Hall has created a woman as a man thinks a woman is, rather than the real thing. She irritates me because she is a man’s stereotype view of what we women are like. I bet this would be a very good book. The beginning is awesome. Margaret – I can see why you chose this one. I’ve heard it’s a terrific series, and I hope you’ll enjoy this entry in it. I’ve read one in this series, which I enjoyed, and sent to my mother (she reads mysteries too). The Flight, the one about the plane crash. I have picked up another in the series to try. There is something odd about them that I can’t quite get – something in the set up or structure of the books, or possibly just the ending of The Flight wasn’t quite what I thought it could be. it was very well done otherwise. I do like the book beginning you chose, Margaret!